Kathmandu To Tibet Tour: Travel from Nepal to Tibet is easy by joining our fixed departure, we are operating this Kathmandu to Lhasa fixed departure join in overland tour on every Saturday. 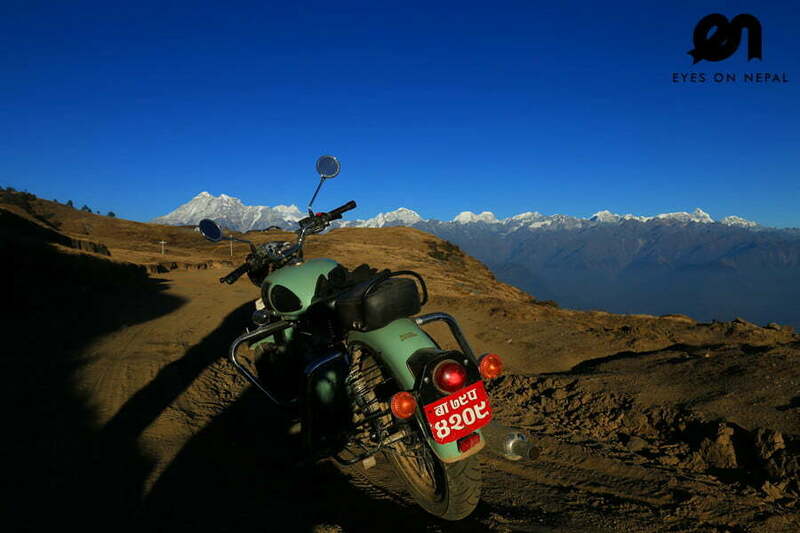 Nepal Tibet Tour starts from Kathmandu to Kyirong border and will end in Lhasa, Tibet. Please note to travel to Tibet from Nepal, we need your passports to be emailed to us at least 21 days before departure date, and you need to pass us your passports in Nepal, and you need to be at Nepal at least for 5 working days before departure to Tibet. Please note Everest Based Camp was closed in Tibet for the year of 2019 until further notice. 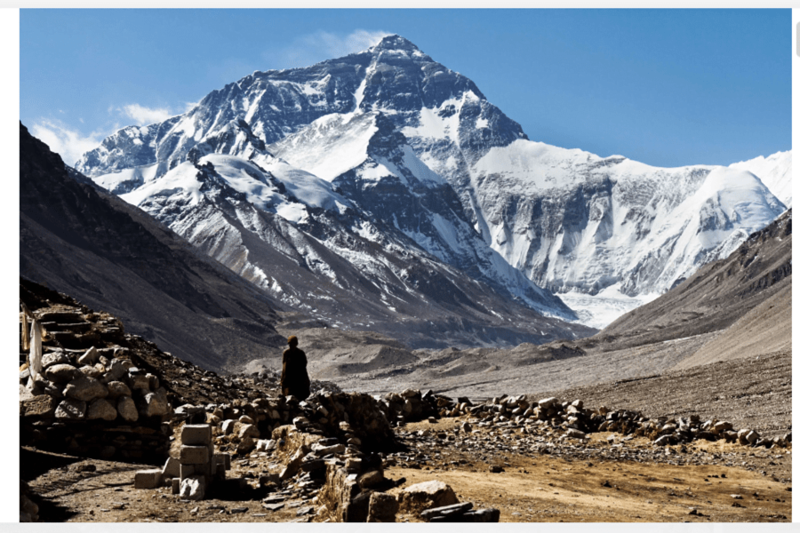 We can’t visit Everest Base Camp in Tibet. Day 6: Sightseeing tour in Lhasa (3565m): Visit Potala Palace, Jokang Temple and Bharkor Bazar! Day 7: Sightseeing tour in Lhasa (3565m): Visit Drepung Monastery and Sera Monastery! Day 8: Lhasa (3565m) - Departure! After breakfast, you will start your journey to Old Tingri (4300m). We will drive through Kyirong Pass (4900m), and drive along the beutiful Peikutso Lake (4600m) and continue to Old Tingri (4300m) which is 180km from Kyirong(2800m). In the morning: You will start your tour at around 9am from your hotel and then drive to Gyangtse – the third largest city in Tibet. In the afternoon: Have lunch in Gyangtse and check in hotel. We will visit Palchoe Monastery and Kubum Pagoda Stupa. In the afternoon, explore the old town of Gyangtse. 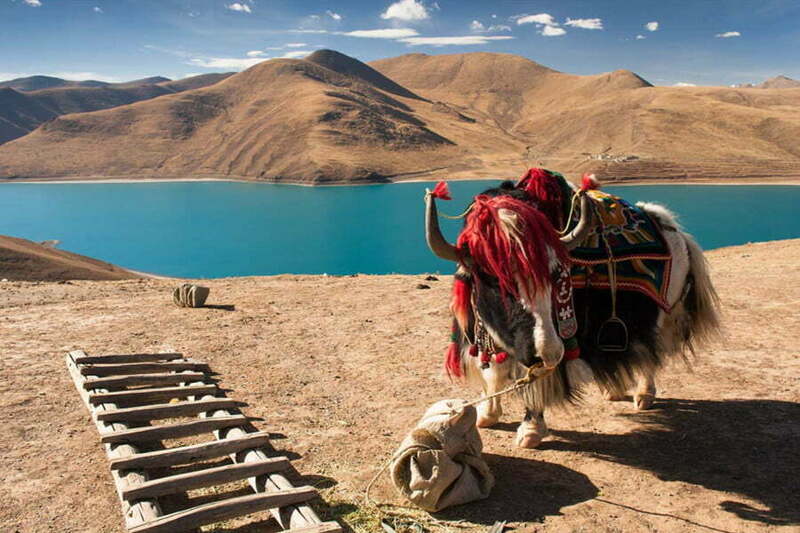 It’s one of the top four Buddhist holy lakes in Tibet. 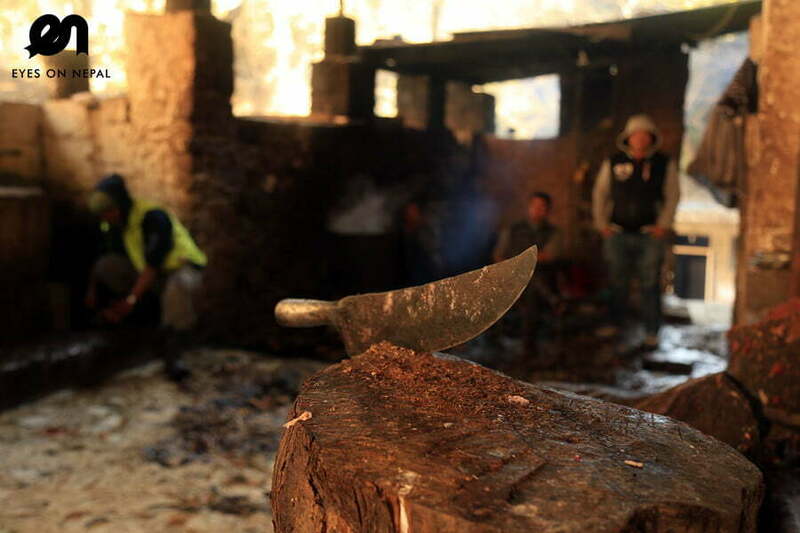 It’s about 150 kilometers from Lhasa and takes 2½ hours to get there by car. NOTE: Yamdrok Lake is one of the top four Buddhist holy lakes in Tibet. It’s about 150 kilometers from Lhasa and takes 2½ hours to get there by car. 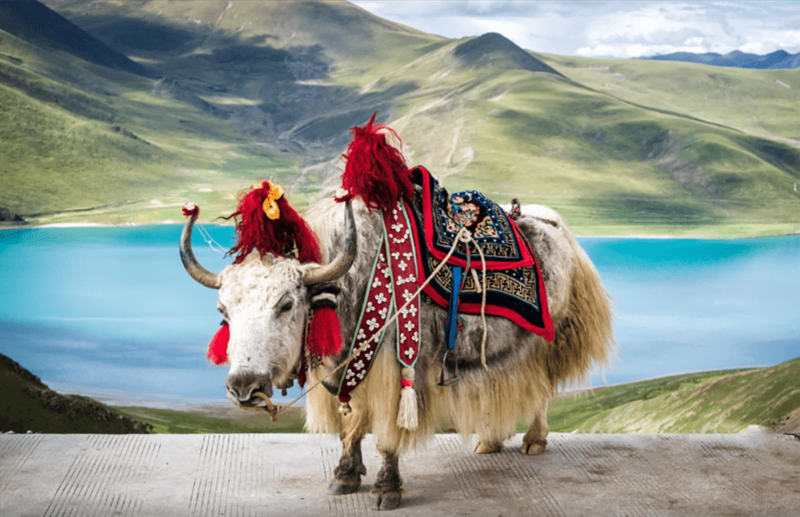 Taking photos with a yak or Tibetan mastiff by the lakeside costs around 20 yuan per person. In the afternoon: You will have your lunch at Nakartse Country which located between the Yamdrok Lake and Karo La glaciers. In the evening: Drive to Lhasa after the visits, and we will overnight in Lhasa. In the morning: After breakfast, we will visit the must go attraction in Tibet – Potala Palace. It is known as the highest palace in the world standing on the Red Hill of Lhasa. The Potala Palace is a house of Tibetan history, culture, religion and art. NOTE: You should be physically ready for the Potala Palace, which has a lot of steps. Prepare to enjoy the resplendent chambers and exquisite wall paintings. In the afternoon: There are two attractions for you to visit in the afternoon – Jokhang Temple & Barkhor Street. You’ll visit the Jokhang Temple. As the house of the Buddha, Jokhang is the holiest destination for all Tibetan pilgrims; as the spiritual center of Tibet. Jokhang Temple is the perfect place for you to experience the devotion of Tibetans. Wandering around the crowding Barkhor Street. You can choose to take part in the religious activities with the locals, to do a bit of souvenir shopping, to eat street food, or just wandering around on the street. NOTE: Bharkor street is the most colourful market in Tibet and is best place to do shopping. Potala Palace: Known as the Dalai Lamas’ Winter Palace, it houses countless treasures including eight Dalai Lamas’ holy stupas. The most luxurious stupa is the 5th Dalai Lama’s, which comprises 3,721 kilograms of gold, 52 tons of silver, and over 15,000 jewels and pearls. Jokhang Temple: It is “Mecca” for Buddhists as it preserves the life-sized golden sitting statue of Sakyamuni when he was 12 years old. In the morning: Enjoy breakfast in your hotel and start your day with a trip to Norbulingka. Then drive for 15 minutes to see Drepung Monastery, where you will climb the stairs up to the hill and visit the delicate temples. If you are lucky, you will hear the monks chanting together, which sounds just like singing. In the afternoon: Have lunch in a local restaurant and try some Tibetan food, such as yak butter tea, which will help you to adapt to the altitude. In the evening: After lunch, visit Sera Monastery and watch the monks’ debate. Guess the meaning of their gestures and grasp the chance to take photos. Norbulingka – Formerly known as the Summer Palace for the Dalai Lamas, it is now a beautiful public park with plenty of plants providing extra oxygen. Due to this, it is the best attraction to visit at the start of your trip. Sera Monastery – The highlight of visiting this monastery is watching the monks’ debate, which is held at 3:30pm every day except for Sundays. Drepung Monastery – It is the biggest monastery with the most monks in Tibet. It also has the biggest monastery kitchen, which allows 10,000 monks to have their meals together. Walk clockwise when visiting Barkhor Street or any temples in Tibet. After breakfast, you will catch your train/international flight to Kathmandu/Chengdu. Tour ends. Bye Bye! USD 850 per person, 1 to go. We have fixed departure group on every Saturday, confirmed departure. NOTES Based on double sharing. NOTE: Usually it costs about USD 3 – USD 15 per person for one meal in TAR (Tibet Autonomous Region). Flight Fare Lhasa to Kathmandu is USD 410 to USD 450 | NOTE: Subject to change. Write in to us. Tell us your preferred travel date. Email us your passport at least 21 days before your departure date to Tibet. Upon arrival in Nepal, we will meet up with you to collect your passport, you need to fill up a form from Chinese Embassy Kathmandu with your latest passport size of a picture. After 5 working days, we will give you your TIBET Permit, and you are ready to travel to Tibet from Kathmandu. We will depart you to Kyirong Border via JEEP.